Everybody knows the fairy tale story of the Walt Disney movie "Sleeping Beauty" (1959). Princess Aurora (Mary Costa) is the beloved only daughter of her loving royal parents, who name Aurora that because she brings sunshine into their lives. 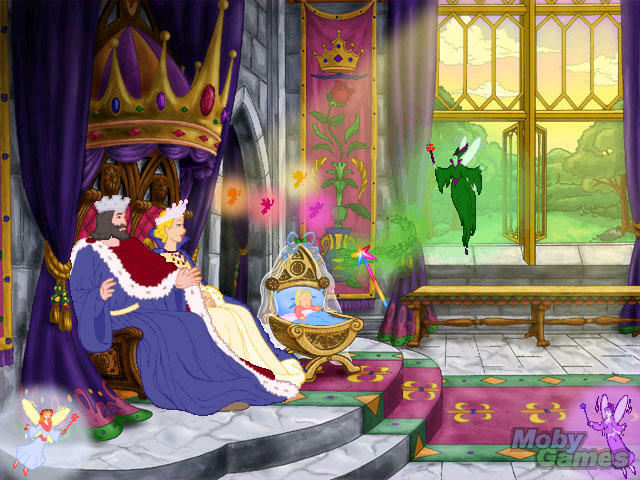 A neighboring kingdom, ruled by King Hubert (Bill Thompson), has an eligible suitor, Prince Phillip (Bill Shirley). A marriage is arranged to bring the two families together. 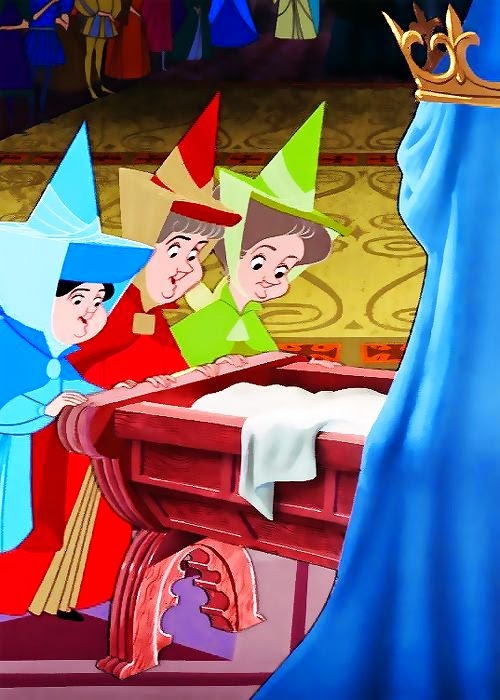 There are three Good Fairies who come to bestow blessings on the match and lavish gifts upon young princess Aurora: Flora (Verna Felton); Fauna (Barbara Jo Allen); and Merryweather (Barbara Luddy). They are good-natured, though quarrelsome. There is an uninvited Fairy, however, who should have been. She learns of the proceedings and decides to pay a visit anyway. When she shows up, that is when the trouble starts. 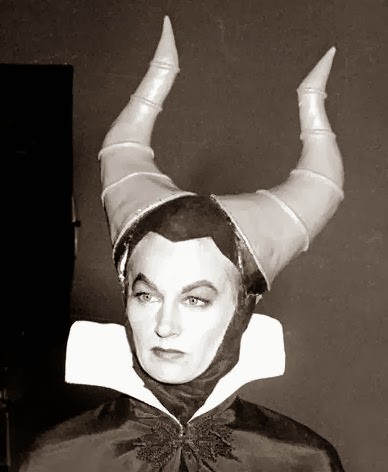 The uninvited guest in this Disney movie is Maleficent (Eleanor Audley), who is known to everyone far and wide as The Mistress of All Evil. Maleficent has come down from her lonely perch on Forbidden Mountain because she is upset at being excluded from the festivities. Just like with "The Godfather, "you have to show a little respect." When that simple courtesy is withheld, Maleficent takes offense, so how she naturally reacts to this slight isn't really all her fault. Of course, the manner in which Maleficent makes her displeasure known is completely Maleficent's fault. 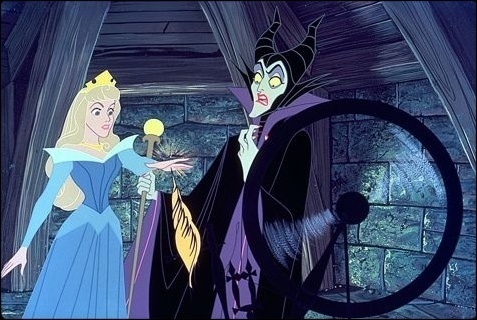 She curses Aurora, and Maleficent isn't someone you want cursing you. Maleficent states specifically that at the age of 16, Aurora will prick her finger on the spindle of a spinning wheel and die. Thus, everyone must live in fear for lovely Aurora's future until that is resolved somehow. Maleficent has an idea, and the bird is anxious to help. This shot gives a good idea of the Super Technirama 70 widescreen effect. 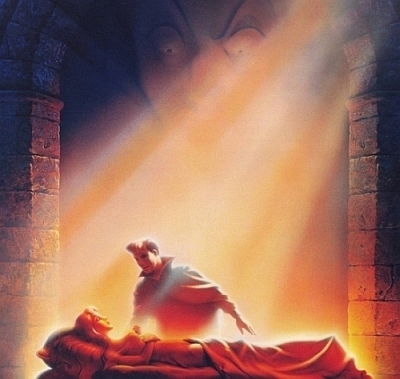 "Sleeping Beauty" was filmed in anamorphic widescreen and recorded in 6-channel sound. The Good Fairies cannot stop Maleficent or override her curse, but they can help in other ways, and boy do they help. Fairy Merryweather places Aurora into a deep sleep until the spell can be broken, and the fairies carry Sleeping Beauty Aurora off into the forest so she can hide, incognito, under the name "Briar Rose." King Stefan (Taylor Holmes), frantic to save Aurora even though she must leave him forever in order to survive, orders all the spinning wheels in the land destroyed, and they are - all except one. An evil creature like Maleficent will not be deterred. 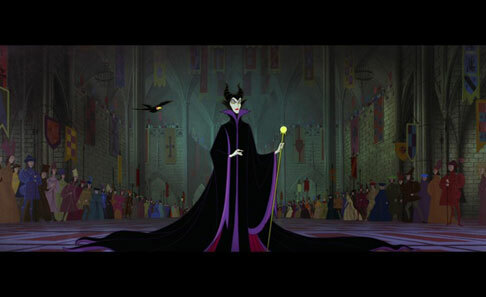 Maleficent scours the kingdom to find Sleeping Beauty/Aurora/Briar Rose, determined to make her prophecy become reality. While this Disney movie follows the basic "Sleeping Beauty" fairy tale closely, it makes a few modifications. 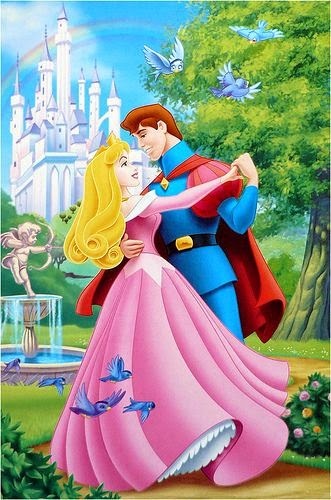 The prince, who in fairy tales usually only arrives at the last minute and does very little, is very active in this film. He even has a name! 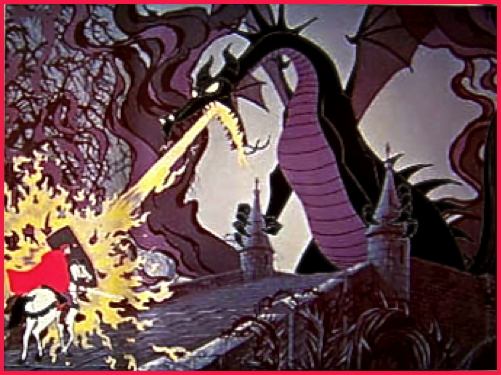 Prince Phillip battles dragons and witches, actively courts Aurora in the forest even though he doesn't know her identity, sings and dances, and generally acts like the first movie super-hero. 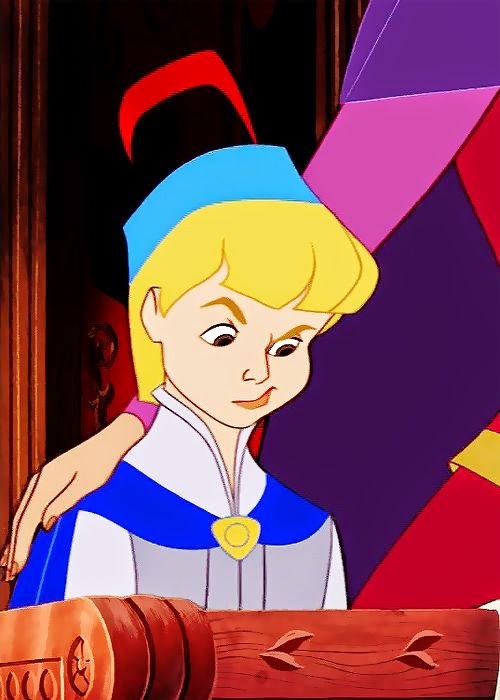 Comparing this film to "Snow White and the Seven Dwarfs" of twenty-two years earlier, you appreciate the stylistic changes that Walt Disney probably, in hindsight, wishes that he had incorporated into that earlier film rather than in "Sleeping Beauty." Princess Aurora is undeniably radiant and compelling. 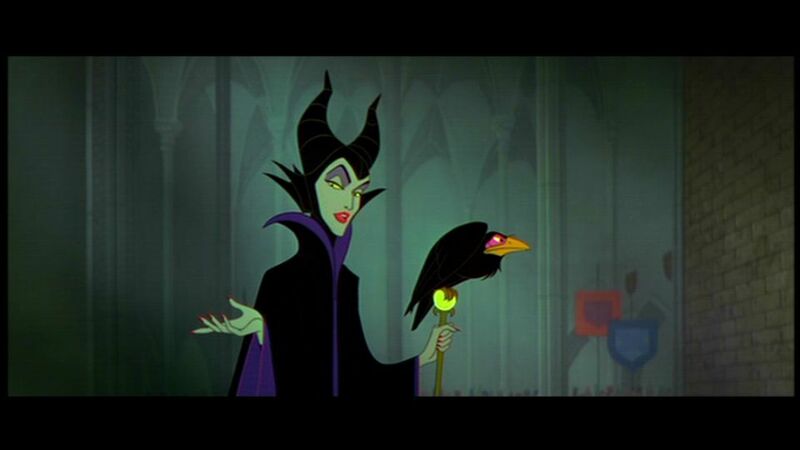 The really sterling character of this Disney movie, though, has to be Maleficent. This fearsome Evil Fairy is brilliantly drawn, quite beautiful in her own way, with garish stylistic similarities to the Evil Queen in "Snow White" and the cackling laugh of the Wicked Witch in "The Wizard of Oz." There also, of course, is a touch of Eleanor Audley herself thrown in as well. The evil oozing out of Maleficent is all the worse because it stems from common emotions such as petty jealousy and spite that we all can understand. When the furious Maleficent finally turns into a dragon and threatens Prince Phillip specifically with "Hell" (a rarity indeed in a Disney fairy tale movie, to use a religious term or profanity or however you want to characterize it), it is obvious that this is not just any old dragon. It is a demon dragon embodying the fiery spirit that drives a Maleficent who is crazed with hatred and frustration and self-loathing. 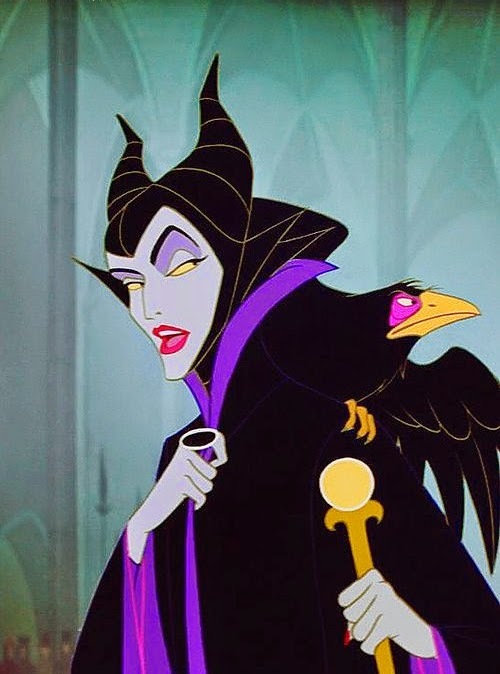 Maleficent as voiced by Eleanor Audley, who also did Lady Tremaine in the original "Cinderella," is deliciously evil. Audley was an old hand at creating classic characters in Disney movies, and she knew how far could take her interpretation without going completely overboard. She also was a bit of a character herself, revelling in acting out her character's scenes for the Disney animators so that they could study her facial expressions. 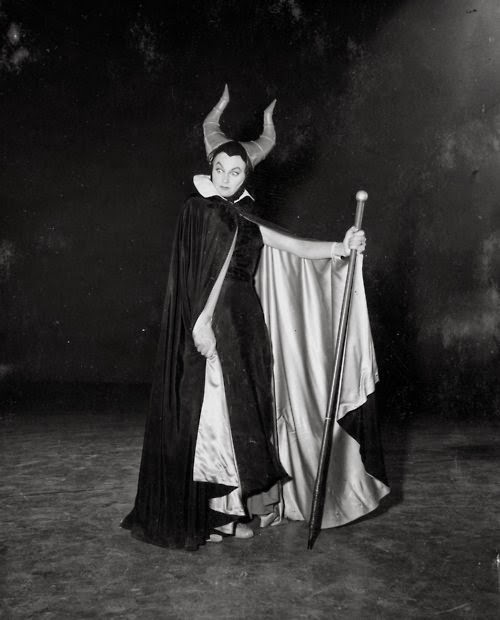 Eleanor Audley, a lovely eccentric heroine who liked to don her character Maleficent's costume. Her distinctive voice was the outcome of a case of TB in her early 20's, a disease which followed her throughout her life but which she overcame. As portrayed, the character of Maleficent is one of the great villains of all literature. The character owes much to the genius of Audley, but it is an iconic role for anyone. Disney finally "reimagined" the character and made "Maleficent" in 2014, starring Angelina Jolie in the title role. It is interesting to see a Disney move fairy tale villainess from her own point of view, and if anything "Maleficent" adds to the legend. "Sleeping Beauty" may be a fairy tale you subconsciously have filed away in the back of your brain as passé, but it is... has been... and remains front and center for very powerful people in the creative arts. There are few tales like this, a powerful story with depth and emotion and many intricate parts that resolve to a satisfying whole. "Sleeping Beauty" Aurora also is one of the great creations of Disney movie animation, though Maleficent is a hard act with which to compete. She is beautiful, and must be for the story to resonate. 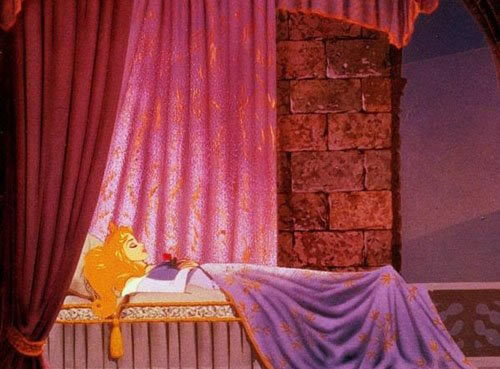 Mary Costa as Aurora demonstrates a fantastic operatic singing voice, and never got her full due for voicing this classic role of "Sleeping Beauty's Aurora." A surprising fact is that despite the film being named after her, Princess Aurora only appears onscreen for eighteen minutes - which for an actress would be considered a supporting role. The true guilty pleasure of "Sleeping Beauty" is that Maleficent is the anti-hero and dominates the proceedings from beginning to end. The music is stunning as well. Tchaikovsky's "Sleeping Beauty Ballet" is used throughout, and the original song "Once Upon a Dream" is one of the great tunes of all animation, sung in "Sleeping Beauty" in innocent fashion (and in the later "Maleficent" with a darker tone, showing how adaptable the tune is). George Bruns scored "Sleeping Beauty" with cutting-edge 6-track stereo which he had to go all the way to Germany to find (the Beatles several years later had to make do for much of their existence with four tracks, and actually began with only two). He was justly rewarded with a well-deserved Oscar nomination. For my money, "Once Upon a Dream" is the best single Disney song of all time, right up there with anything from "Mary Poppins" - and that is saying a lot. There are many scary scenes in this Disney movie, which gives the film pop. 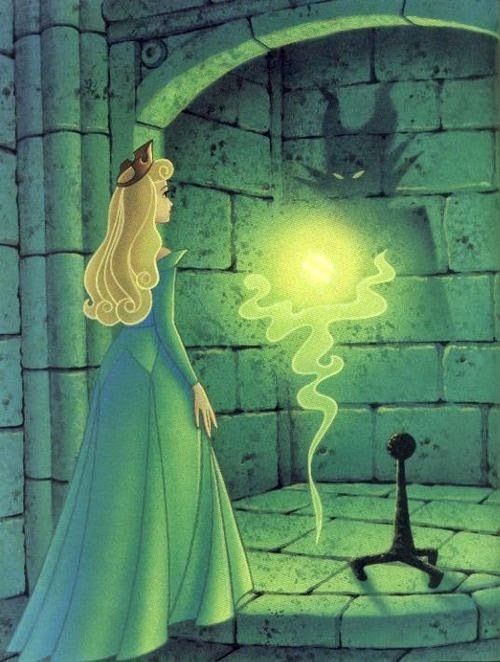 The background music contributes to the air of foreboding to "Sleeping Beauty," and some of the scenes almost appear psychedelic, such as the evil Maleficent inducing Aurora to touch the deadly spindle, leading her there with a spectral ball of green fire. Even Maleficent doing simple things like oozing up the stairs of her dark palace, or her pet raven looking back with malevolence, are spooky. 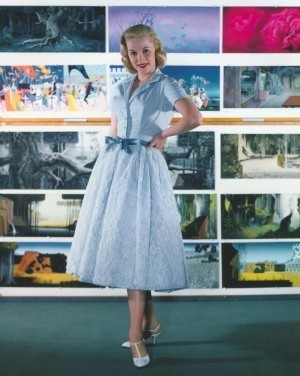 The "Sleeping Beauty" artwork was the brainchild of Eyvind Earle, officially the color stylist, who lavished inordinate time and detail on the backgrounds and the artwork. 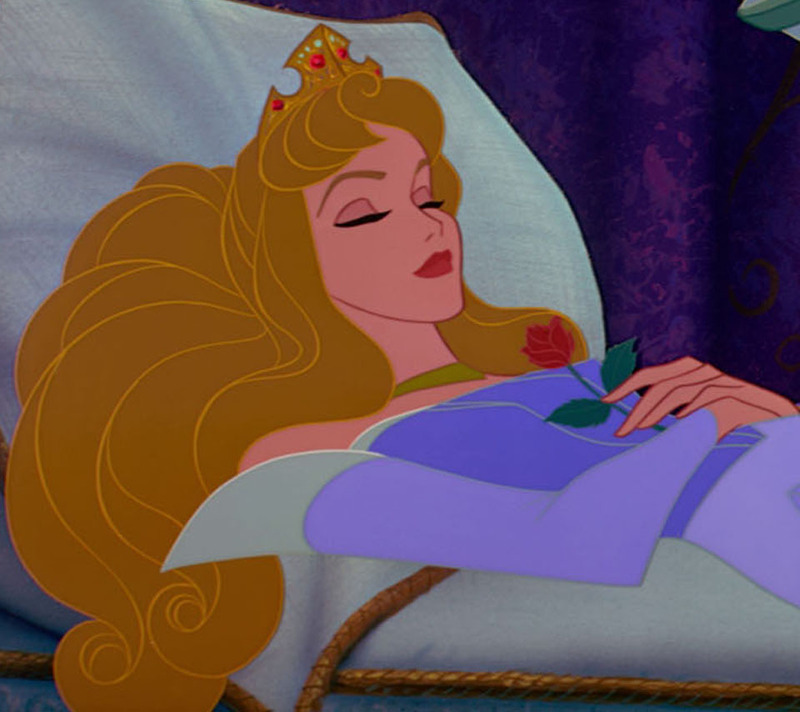 "Sleeping Beauty" has a unique look that combines the medieval and the modernistic, something a modern-day computer simply can't replicate in quite the same way. 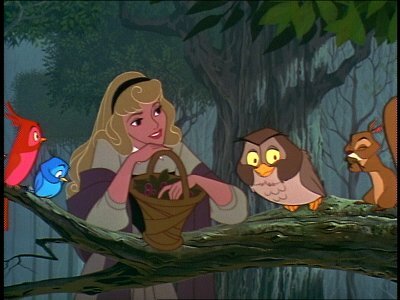 They will never again be able to make an animated film with the stylistic character of "Sleeping Beauty." 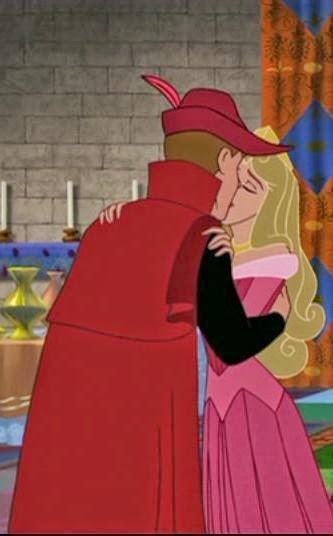 The most surprising thing about "Sleeping Beauty" is that this Disney movie, the most expensive animation ($6 million) made by the studio up to that time due to Walt's rigid refusal to accept less than perfection for the fairy tale story of "Sleeping Beauty" Aurora, was a financial failure when it came out (though it was re-released many times and thereby ultimately became the second-highest grossing film of 1959). Clyde Geronimi, who had helped direct "Cinderella" back in 1950, gets the directing credit for "Sleeping Beauty," but this was Walt's pet project from start to finish, almost an all-star affair - which made its initial failure all the more painful. Even the great Chuck Jones worked on "Sleeping Beauty" during a brief time when Warner thought that 3D was going to take over, but it didn't matter. The time simply was not right for animation, or a classical fairy tale, or both. Also, the tale and style is very similar to "Snow White and the Seven Dwarfs," enough so that it seemed as though Ol' Walt had run out of ideas and was repeating himself (and he even originally wanted seven fairies, not three....). It didn't matter that his mantra throughout production was "It can't be like Snow White," when you see Aurora in the forest mingling with the gentle forest creatures, it almost seems like a remake of that classic Disney movie - and no remake was necessary, the original still held up quite nicely. 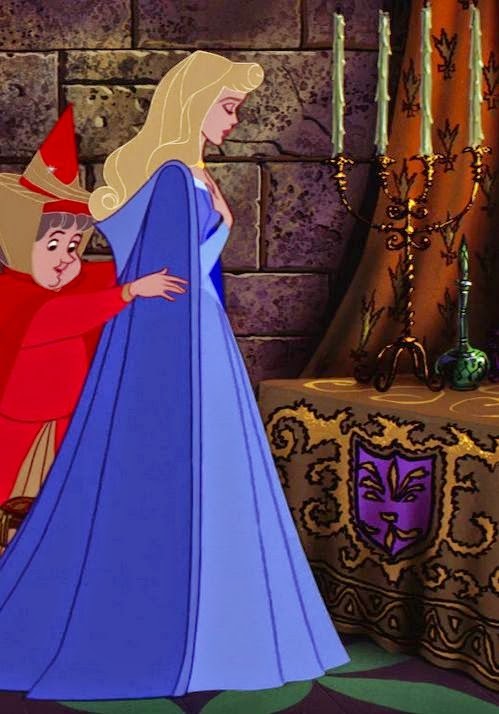 Mary Costa, who voiced Princess Aurora in "Sleeping Beauty"
Several scenes discarded from "Snow White" were used in "Sleeping Beauty," underlining the similarities. In addition, the heroine disappears for much of the film and only has eighteen lines of dialogue in the entire Disney movie. So, essentially this becomes a Disney movie about the supporting players such as the royal parents, Maleficent, Prince Phillip and the good fairies. The fairies are all very nice, but the film is "Sleeping Beauty," not "The Three Good Fairies," so there's a slight disconnect at work. A final problem was the rise of Television: Disney had a weekly program on throughout the '50s, and the "common wisdom" was that there was no reason to pay to see something you could see for free on the little box in the living room anyway. The entire film industry quaked in terror, not just the Disney movies studio, leading to the first "3D" craze (sound familiar?). Of course, there was nothing quite like a quality Disney movie such as "Sleeping Beauty" on the tiny black-and-white sets most people were using then, but many people at time followed what seemed like common sense like sheep. A fine example of peer pressure in action, or maybe mass psychosis. Disney's final losses were recouped by its huge television revenues. Walt Disney, badly burned, became gun-shy about these expensive animated feature films that sometimes jeopardized the entire studio. Wouldn't you, if you had other sources of revenue that were steady, growing and enabling you to expand to new, profitable ventures such as theme parks? Walt Disney even talked about shutting down the Disney movie feature film animation operation entirely, though he never actually followed through on that threat. Disney did look for ways to cut costs on the production of Disney movies. He was forced to lay off a lot of people. In any event, the Disney animation studio didn't experience a true revival for many years, despite occasional huge financial successes such as "The Jungle Book" and "The Rescuers." Finally, at long last, Disney took a chance on another fairy tale in 1989, thirty years later, with "The Little Mermaid." When that Disney movie succeeded, "Beauty and the Beast" (1991) followed and cemented the Disney Renaissance, pumping new life into the whole animation genre. Walt Disney Productions movies returned to being the powerhouses in animation that they once seemed destined to become. 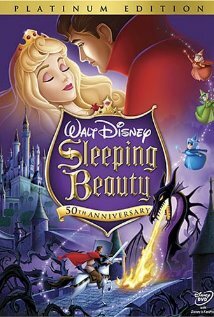 But, despite the problems "Sleeping Beauty" caused and its initial lack of popularity, "Sleeping Beauty" holds up well beside any of Disney's later films, and perhaps above them all. 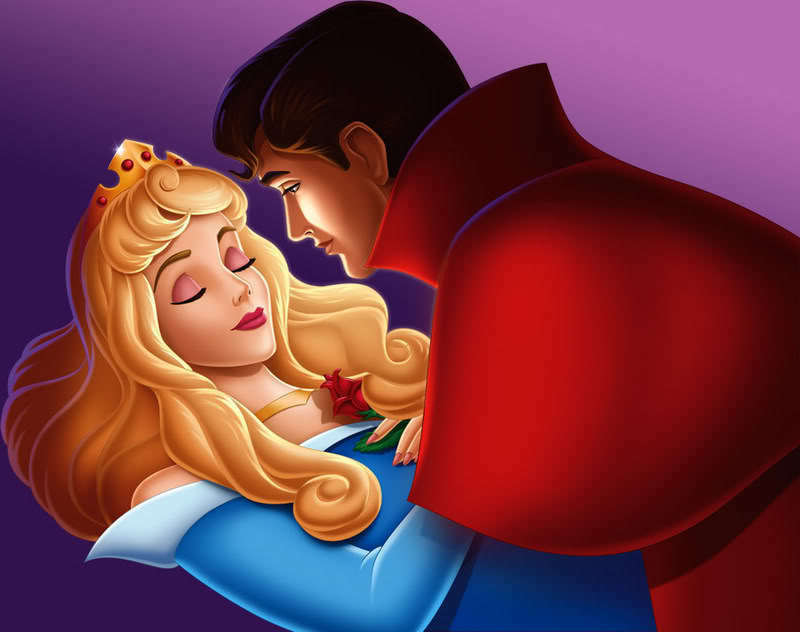 "Sleeping Beauty" is one of the absolute classics and delights in the Disney movie library is this tale of love and redemption. The Prince finds his love in front of a looming enemy. Isn't this animation design awesome? You could say that "Sleeping Beauty" is a film only for little girls. You can say that "Sleeping Beauty" is old and tired and nobody now needs to view it to understand animation's possibilities. You can say that all of women's troubles in the world are caused by wanting the "Sleeping Beauty" fairy tale to be true for everyone, when it can't be. You can say that animation has surpassed "Sleeping Beauty" and that this Disney movie wasn't ever as good as "Snow White and the Seven Dwarfs" anyway. You can say all that about "Sleeping Beauty" - and you'd be wrong. Ask yourself a question, but answer secretly, only to yourself, and never tell a soul, especially me - in your heart of hearts, when all is said and done - wouldn't it be nice? Below is the original trailer, and below that is a clever comparison of scenes from the original "Sleeping Beauty" and the 2014 "Maleficent" starring Angelina Jolie.